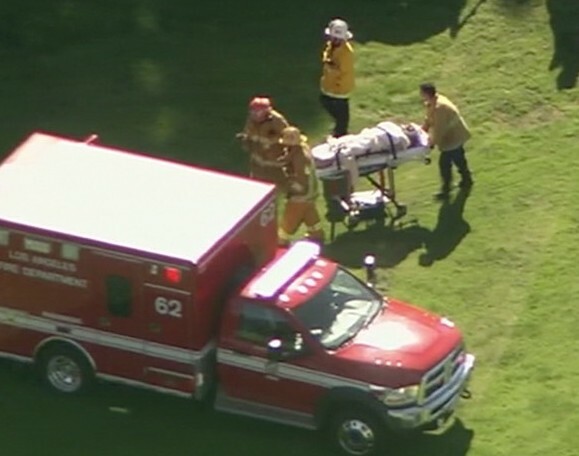 Firefighters believe the Hollywood star is lucky to be alive after his light aircraft crash-landed on a golf course in LA. 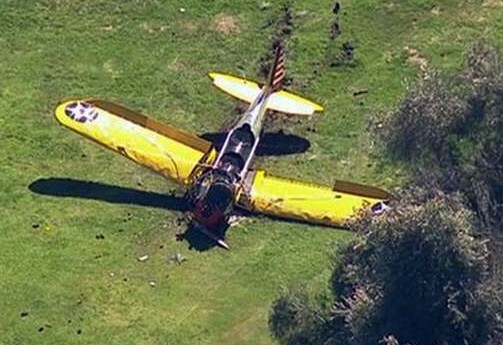 Harrison Ford has been injured after the plane he was piloting suffered engine failure and crash landed onto a golf course in Los Angeles. The 72-year-old was flying solo in a World War Two training aircraft when it crashed into Penmar golf course in the Venice area at 2.25pm local time. The single-engine plane clipped a tree as it went down shortly after taking off from Santa Monica Airport, about a mile away, the LA Fire Department said. The yellow plane with stars on its wings was upright and mostly intact after the crash. No one on the ground was hurt. Ford suffered multiple gashes to his head and was taken to a nearby hospital for treatment, entertainment website TMZ reported. Witnesses were reported by local media as saying the actor was helped out of the plane by several bystanders and that he could use his legs. "At the hospital. Dad is OK. Battered but OK! "He is every bit the man you would think he is. He is an incredibly strong man." "He was banged up and is in the hospital receiving medical care. The injuries sustained are not life-threatening and he is expected to make a full recovery." Fire officials would not confirm the pilot's identity, but an official familiar with the crash confirmed Ford was flying the aircraft. At a news conference, Assistant LA Fire Chief Patrick Butler said the victim "suffered some moderate trauma, was alert and conscious" and was in a "fair to moderate" condition. He added: "In my personal experience of 25 years in the department I have been involved in several plane crashes - single engine, small personal aircraft - and normally the outcomes are fatalities, so yes we are very thankful that the passenger had moderate injuries." In audio with air traffic control, Ford, who was flying at 3,000 feet, can be heard saying in an urgent voice: "Engine failure," before requesting "immediate return" to the airport. But Ford appeared to have used his extensive piloting experience to skillfully bring down the plane on the golf course and avoid nearby homes. Christian Fry, of the Santa Monica Airport Association, said: "I would say that this is an absolutely beautifully executed - what we would call - a forced or emergency landing, by an unbelievably well-trained pilot." LA Police Department spokeswoman Officer Nuria Vanegas said the cause of accident appeared to be "mechanical failure". Carlos Lugo, 63, who was playing golf on the green, said he saw the plane lose power and turn around in an apparent attempt to return to the runway at Santa Monica Airport. "When he flew over us we knew it was too late to make it back to the airport," he said. The National Transportation Safety Board said it would be investigating the crash. Best known for his roles in the blockbuster films Star Wars and Raiders Of The Lost Ark, Ford is an experienced aviation enthusiast and has been the owner of several planes. He took his first flying lessons in college, gave up due to lack of money, but got back into it after becoming an established film star. The Ryan Aeronautical plane that he was flying was built in 1942 - the year Ford was born - and registered to the company MG Aviation Inc.